I read Roshan Kumar Singh’s story on Kantipur earlier this month and realized that I may know him (because of where he is from in Kathmandu). If not, we most likely have mutual friends, just as with the two Nepalese-Brits “disppeared” by the Qatari authorities. I had a number of other reasons which prompted me to post Roshan’s story on my Facebook wall. Firstly, it was to highlight the gross miscarriage of justice he had suffered from. Thirdly, I wanted to publish the translation to see if I could reach people in Doha, Qatar, who might be able to help him, one way or another (see below for details). What follows is an image of the original article and the English translation. Doha (Qatar), Bhadra 23 – December 16, 1997, Roshan Kumar Singh of Thamel, Kathmandu had come to Qatar leaving behind three small children with Shova, his 20-year-old wife. His youngest son at the time was just a month-and-a-half-year-old baby. The eldest daughter had been five years old and the middle son two. Roshan Kumar had no option but to go abroad to afford everything from raising them to paying for their education. Like all parents, the couple had constantly worried about the future of their children. They agreed that Roshan would work abroad for a few years to earn money and Shova would raise the children. But the wheels of life did not turn as expected. Roshan did earn money in Qatar. He would even send money back home to the family regularly. But their day of reunification never came! Roshan worked as a supervisor at an aluminium company. He was preparing to return home when the company was about to fold. Unfortunately, on January 26, 2001, the vehicle he was driving met with an accident. The vehicle suffered some damages. Although Roshan was not seriously injured, greater misfortune than the accident followed. The police filed a case against him charging him with driving under the influence. In Qatar, once a case is registered in the courts, the accused cannot leave the country until it is settled. On April 7, the court handed down a guilty verdict with the option of either paying a two-thousand-riyal fine or serving 6 months in jail. Roshan had yet to collect some salary and other benefits from the company he worked for. He filed a case with the Department of Labor against the company, claiming his salary, compensations for overtime hours and others amounting to a total of 29 thousand Riyals (7 lakh 83 thousand rupees) [about 8 thousand US dollars]. The case reached the Supreme Court and lasted three years. He had hired a lawyer for four thousand Riyals to work on his case. On December 31, 2003, the court ruled in his favor saying that he deserved to receive compensation equal to his claim and additional compensation equal to the repair cost of the vehicle damaged in the accident. Following the settlement, Roshan started preparing his return home. In 2004 Qatar announced a three-month amnesty to runaway workers and to those without a visa/with expired visa, to return home without penalties of any kind. Roshan’s company had already packed up by then. As his visa, therefore, had not been renewed, he had become illegal. He enlisted Search and Investigation Department’s help to advance and process his passage home. After everything has been sorted out, his flight home was scheduled for October 26 that same year. He informed his family of his arrival date. It had already been 7 years since he had first left home. Saying goodbye to all his friends, Roshan reached the airport determined never to return to Qatar ever again. At the airport immigrations, to his dismay, he discovered his ‘travel ban’ had not been lifted. “I was so happy to be going back home for the first time, there was no end to my joy,” he recounted. “Who should I ask to lift this ban?! I tried to find out if indeed there were any more pending case. There were none. “The only place left to seek help was the Nepalese embassy. Ram Kaji Khadka was there at the time,” he added. Roshan was left with absolutely no support in a foreign land. According to him, the embassy was uncooperative. “I had no one to help me. But to survive in Doha and to support my family in Kathmandu I had to work, since returning home was uncertain. “I started working as a taxi driver without a license. From time to time I would bump into a random police check. But, I was never arrested. Shova would ask when I was coming home. I could not give a clear-cut answer. I would say, let’s see, work is going on. Don’t know when it will be. Roshan continued working in Doha with neither a driving license nor an Identity Card. Sometimes he drove people to Qatar Foundation, sometimes to Doha airport. There wasn’t a week, when he didn’t pick up and drop off Nepalese arriving in, and departing from, Qatar. He, however, felt like a caged bird. Nonetheless, Roshan had not given up on leaving. On October 12, 2013, he had booked his flight again. His departure was to have been processed by the Search and Investigation Department. That time around, he had been confident. Unfortunately, that day too, he failed. Thereafter, Roshan started working as a driver for a Captain in the Qatar Army. On April 10, 2013, he executed a risky plan to get arrested by the police. “I drank alcohol, and drove out a government vehicle the Captain had left in his house. I then deliberately parked the vehicle in a no parking zone,” he explained. He had deliberately executed this with the hope of being deported home after being arrested. Except, since that day, he has been held at the Deportation Center. He is even the supervisor to all the Nepalese detained there. “From here too, they have taken me twice to the airport (on February 10 and July 10), only to discover that the travel ban had not been lifted,” he added. Prisoner Number 6671, Roshan Kumar is kept in block number 7 of the center. “In December, when a representative from the Nepalese Embassy came to visit the Nepalese detainees, they also met me. Observing that it had been been many years since I hadn’t been allowed to return home, they took my photo. They left promising to make arrangements for my return home one way or another,” he says. In prison, Roshan, seeing the sufferings of others, he worries more about their predicament than his own. “There are loads of Nepalese languishing here after their companies failed to get them their visas. Some have not been able to pay back their loans,” he says. Roshan is now 51 years old. His wife 37. Their children are all grown up. “Having suffered for so long and so constantly, I’ve forgotten what it is like to not suffer,” he says. I know the journalist who wrote the story. He is the same Hom Karki who wrote an article about me following our conversation on May 13, 2013, the day after my release from jail in Doha, Qatar. I have been in touch with Hom and is aware of this post. If you can help in any way, could you please get in touch by email? Write to dorjeATdorjegurungDOTcom. I’ll give you Hom’s contact details who will be able to update you on Roshan’s status and how you might be able to help re-unite Roshan wih his wife and three children, and right this horrendous and despicable wrong! After writing the blog post, in addition to sharing it on Facebook, Twitter, Linkedin and Google+ and asking others to do the same, I contacted a number of people working on migrant labor rights issues. Lack of a legal aid system capable of aiding Roshan before the case escalated. No public benevolent fund for workers in distress who are stuck in debt due to circumstances beyond their control. The sponsor was in possession of the passport, a violation of rights experienced by the majority of low-income migrant workers in the country. When the sponsor closed shop, he was not held accountable to settle dues or return the documents. The court case for a meagre settlement of QR29,000 took over two years. The protracted legal settlement illustrates migrants’ heavily obstructed access to justice, as highlighted by the UN Special Rapporteur. The Exit Permit system that controls mobility of all foreign workers in the country. In a case such as this, where it’s quite evident that the offence was minor, Roshan Kumar continues to pay the price 13 years later. Will we ever know? Probably not! The only reason we know about Roshan is because a journalist published his story! Migrant-Rights.org is awaiting feedback from international rights organizations that are trying to help Roshan Kumar. There is still hope for Roshan and his family’s reunion…albeit after 17 years! Will Roshan be compensated in any way for all that he has lost? Probably not! But I hope I am wrong! I have just been informed that there has been some positive developments! As and when I get confirmation for them, I’ll post them here! He is free and home in Nepal after all those years of living in limbo in Doha, Qatar! The reason I was tentative in the last update was because I didn’t want to celebrate too prematurely without definite confirmation from my contacts in Doha or his wife in Kathmandu that he was indeed in Kathmandu. I am still waiting for confirmation from the wife (long story!) 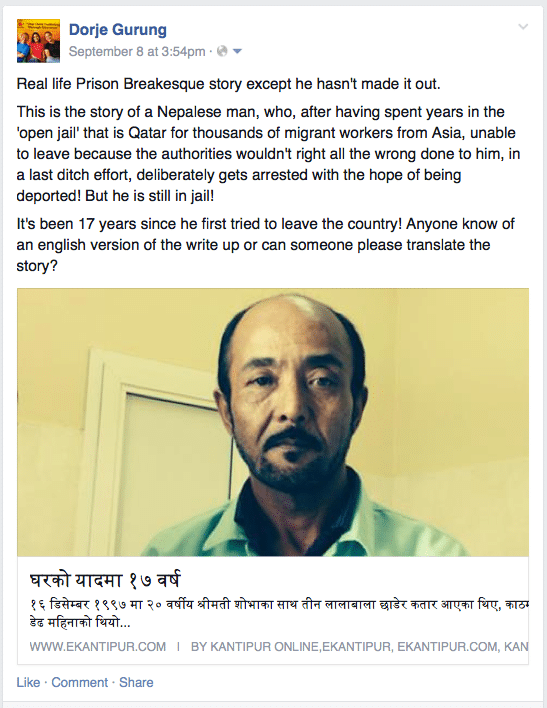 but here’s the last write-up on the man describing how we got him released from the “open jail” that is Qatar: Trapped Nepali worker leaves Qatar after 13 years; Systemic issues still cause for concern.